Like many of us, I first knew Rosencrantz and Guildenstern are Dead by reading the play in high school. I borrowed my big sister's copy and fell completely in love with its wit, inventiveness, and aching humanity. It came as a surprise to hear how many people prized it as a great existential exploration of death because I was so enraptured with the ways in which Stoppard played with the conventions of the theatre itself. I think I probably copied half the play, bit by bit, into my commonplace book over the next few years; some scenes are half-committed to memory without any effort on my part. Productions I've seen in the past never lived up to the version in my head, whether on stage or screen, but I love the play so much that I'll grab any chance to see it in the hopes that this time, it stands up to my expectations. I have never been particularly shy about my bias against a certain well-loved director, particularly known for his work at the Folger. It's no fun to feel like the stick in the mud, stubbornly refusing to go with the tide of public opinion of unabashed love. But experience has taught me that there are at least two distinct Aaron Posners. There is Posner the director who is driven to put his own indelible stamp on every play he touches- no longer content to direct the classics, now he is explicitly adapting them as well (as with his recent diptych of Chekhov reworks). 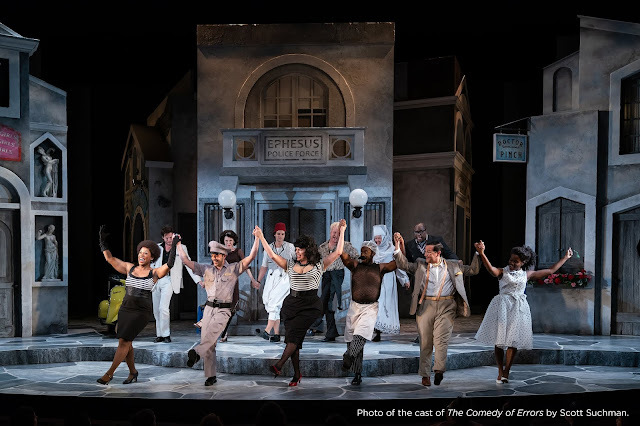 But even before that, if he did Measure for Measure, there were puppets; if he did Comedy of Errors, it had to have a commedia frame story awkwardly superimposed over the proceedings. But then there is another Aaron Posner, one who can approach a play and simply do the play and do it brilliantly. That's the Posner of Arcadia and Orestes, and that's the one I always hope to see. And now, he has brought Rosencrantz and Guildenstern to the Folger- but which Mr. P did we get this time? I'm thrilled to report that it's the latter- this Rosencrantz is a joy, told with great heart, humor, and intense vulnerability. As the titular characters, Adam Wesley Brown and Romell Witherspoon shoulder the weight of this play, navigating Tom Stoppard's complex dialogue and their characters most basic questions with seeming ease. It's a pleasure to see Ian Merrill Peakes as The Player, a role which gives him the perfect opportunity to display his talents for both comedy and drama, and he's well supported by his ensemble of Tragedians. Special kudos must be reserved for Biko Eisen-Martin's Hamlet- the play's transitions in and out of Shakespeare's text are tricky for any production, but Eisen-Martin's tortured prince of Denmark is an arresting presence that reminds you why we're more accustomed to following that guy around Elsinore. Paige Hathaway's gorgeously cluttered theatrical attic of a set and Helen Q. Huang's artfully scattershot costumes complement the strange and confusing world our characters have found themselves in. I grumble about Mr P, but he has produced an excellent production of a much-loved, difficult to produce play. The death promised in the title looms over the piece, but Posner's talented ensemble of actors balances both the humor and the tragedy we find in the absurdity of death's inevitability, producing as if by theatrical magic a warm and moving evening. Posner brings out the truths from the strange little play of the 1970s, gleaned from the fringes of a relic from Early Modern England, which itself stands amid a great theatrical tide of stories and questions that we find ourselves asking again and again, both in life and on the stage. The production has extended until June 28, and I highly recommend that you find the time in the next month to visit the Folger and see it for yourself.